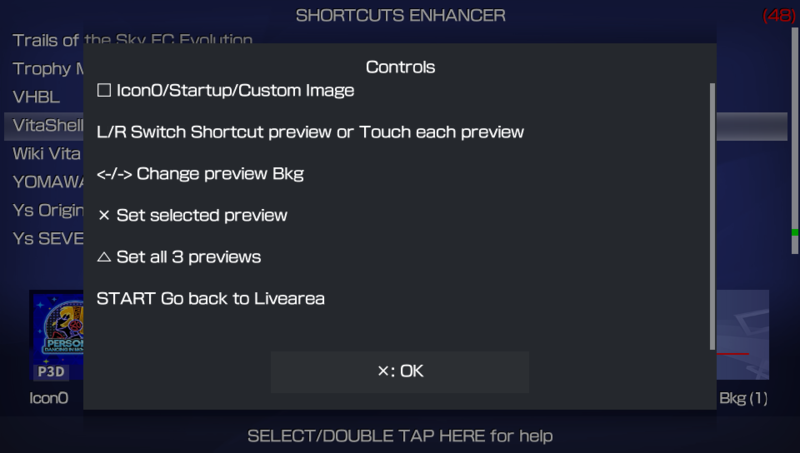 A long test phase and finally the Onelua Team has released another fantastic application called Shortcuts Enhancer. Based on Quickuplauncher 1upus and Moody_Blues IndexMenuMaker, Shortcuts Enhancer is a simple application that allows you to customize the “quick menu” (accessible by pressing the PS button in the LiveArea) to launch applications quickly. With this app you can also create custom images linked to any PS Vita app / game, you can select between the app / game launcher icon or image to create a preview of Shrotcut. When you create preview images, you can choose from a series of colorfull backgrounds (when icon0 is selected, thanks to moody b) to make the shortcuts appear the way you want. Up / Down (Dir Pad) Scroll through the list of games / apps. Right / Left (Dir Pad) Change the preview background. R / L or Touch Pad (or tap the preview to highlight it) Switch to the preview of the link. Square button between Icon0 / Startup / Custom Image. Accept: Set the selected preview to appear in the index menu (reboot required). Triangle: Set all 3 previews in the index menu (reboot required). Start: Return to Livearea (when changes are made, a reboot is required for the changes to take effect).